Maybe the word “review” is not a fair statement when I’ve only played the stick a few hours, but here are my first impressions of the highly reviewed Yonex Ai 98 . First of all, it’s very easy to get used to. It moves briskly through the air and is still remarkably arm-friendly which I don’t find in a similarly playing racquet like the Aero Pro Drive . This is obviously key in the modern game where you need massive racquet head speed to create spin on the ball. Secondly, it’s quite stable for its weight. Some players who prefer players’ sticks in the 360 gram range (like me), might still find it too light, but it’s definitely not unsubstantial or “flimsy” and will give most players a really solid and nice response. From what I’ve gained so far is that it benefits from a co-poly string, but strung low to get the nice pocketing effect and some extra power. On the other hand, I’ve never enjoy polyesters strung high so maybe that’s just me. (Wait, no it’s not – most people play low tension polys these days!). It doesn’t offer the same power as an Aero Pro Drive, but definitely more than most player racquets and you can always control the power level by how you string the racquet. It would be interesting to try it with a hybrid setup for example. What it does offer in comparison to the APD is more control and better feel (highly personal, but I think the higher flex contributes). The APD is more powerful and I think I get more spin with it despite both being 16×19 string patterns, but for my game the Ai 98 is close to as good as it gets. It won’t be my first racquet of choice, but of the ones that have come out in the last few years, it’s in the top three on my list. So try the Yonex Ai 98, it’s a highly recommended racquet that I think will fit a wide variety of players. Let me know how it goes in the comments below! 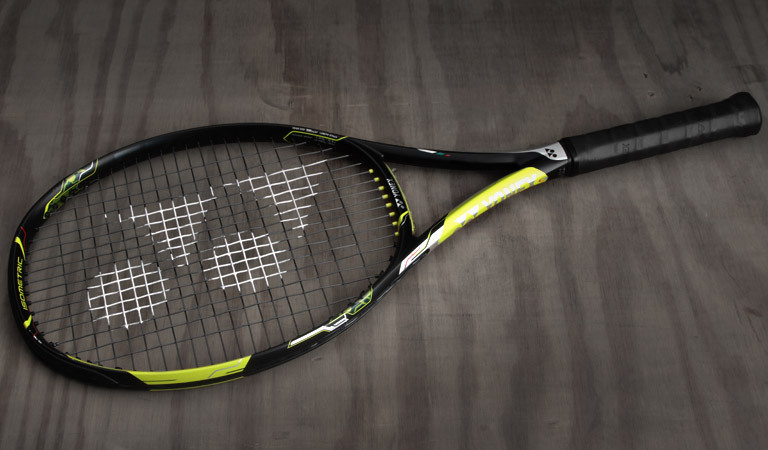 have you tried the Head XT Graphene Extreme Pro. This one and the Yonex ai98 are my favs. The first may be compared with the Pure Drive Tour and the latter with the Pure Aero. What are your thoughts? I haven’t tried the XT version of the Extreme Pro, but previous versions were really good. The Extreme Pro is one of the most underrated racquets out there. In my mind the Extreme is similar, but more arm-friendly than the Babolats. The Yonex Ezone AI or DR 98 is even more arm-friendly and a racquet I personally really enjoyed. I’ve heard some elbows hurt from the Pure Aero unless you string it very low. Got two Ai98 racquets a week ago, strung at 20kg with Solinco hyper-g 1.20mm and have been enjoying some great improvement in my game ever since. I noticed I can now attack much easier from almost any part of the tennis court thx to some heavy spin especially after a Blade 98 countervail 18×20, which seemed quite dead to me. Importantly, I can now feel the pocketing effect that I couldn’t find with the Blade 98 stick. My defense has improved as well since it takes a small wrist action to return almost any heavy shot from the baseline to the baseline. This is probably to a bigger sweet spot/looser string pattern comparing to what I’ve been using before. Finally, the serve. It seems I the angle of my serves has ibcreased significantly, which adds variety and hence gives more confidence when playing a match. I can really feel how my serve makes the opponents feel nervous ? Its a great racquet, I’m sure I will stick to it for a long time. Really happy you’ve found the Yonex Ai 98. Great racquets and superb with the Solinco Hyper-G. Good luck on the courts! I am currently playing with AI98 350g strung polarized w / hyper G 1.25 – 53 lbs … but this feel so soft … i dont “feel” the ball. What do you recommend from me? i have not elbow issues. i’m trying to find a stiffer feel.